The first winter visitors to the Swiss Alps began to arrive in the 1860s and were encouraged to take outdoor exercise as part of their cure regime. They also had healthy visitors and companions who sought recreation while the invalids were resting as part of the sanatoria routine. 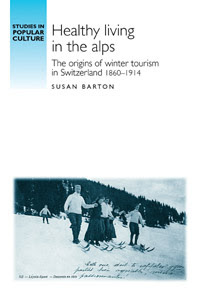 Demonstrating that this is not just part of the history of Switzerland but of Britain too, biographical backgrounds of British visitors to the resorts give depth and context to a history of health and winter sports tourism by looking at the kind of people who would spend months of the year in the Alps. A discussion of the application of modern technologies creates an overall view of the growth of health and sports tourism in Switzerland. Susan Barton is currently promoting the release of the book via a short tour in Switzerland. She is visiting Leysin and signing copies of the book at the Atelier-Boutique, Gare du Feydey. The book is on a special promotional offer of half price at the shop.